This month’s Bostik blogger theme is monsters, with a nod to Halloween coming up. 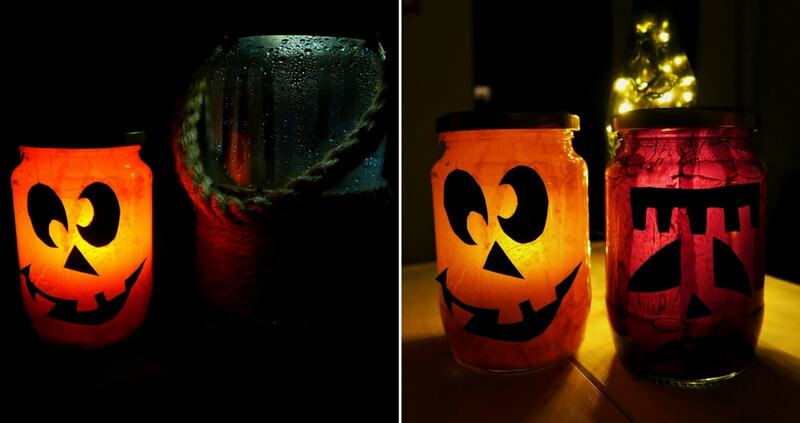 However, this Jar Lantern Craft is so versatile that you can use it to make lanterns for any holiday or purpose. All you need to do is change the colour scheme and silhouettes to match the theme you want. 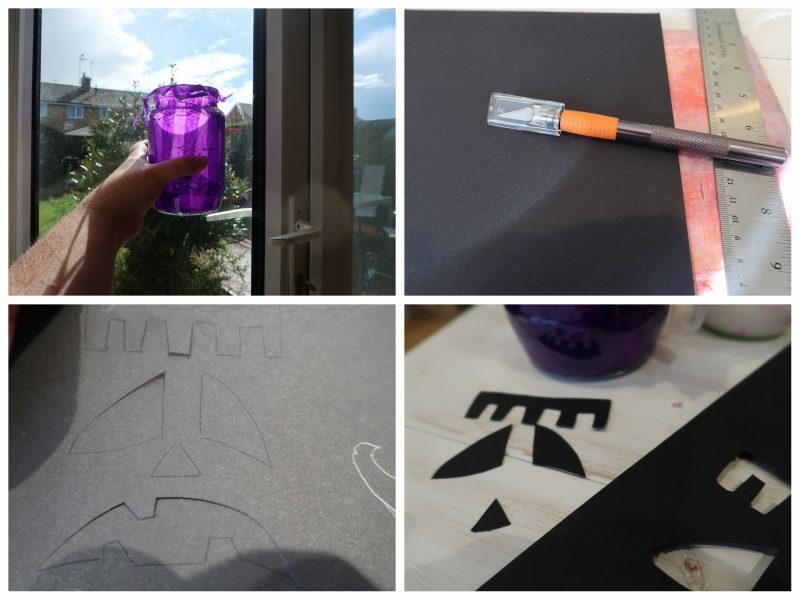 You could, for example, make a useful night-light for a smaller child on a theme of their choice using pink tissue paper unicorn cut-outs or pale blue tissue paper and bird shapes. 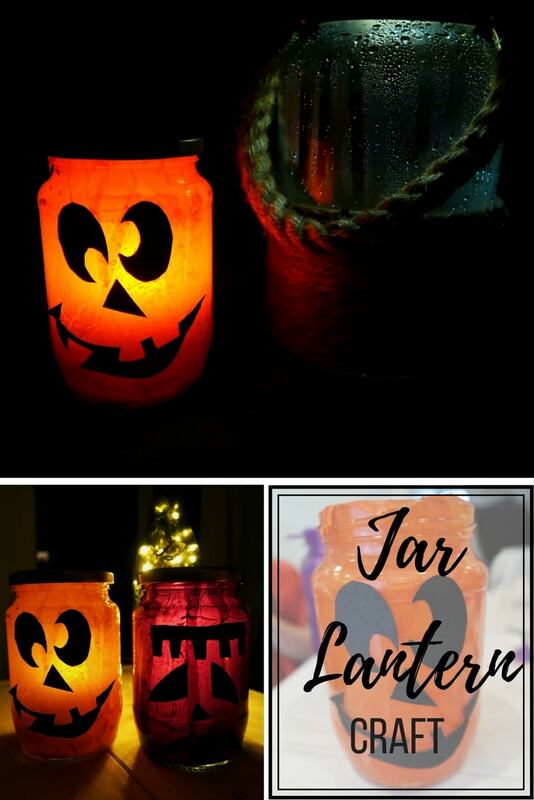 Of course, this jar lantern craft is perfect for making a spooky light to use as a decoration for a Halloween party or to use in place of a pumpkin jack-o-lantern (because sometimes we just cannot be bothered and the supermarkets sell out of pumpkins two days before Halloween). Firstly, ensure the jars are clean and dry. You can remove any labels by soaking them in hot, soapy water. Then, prepare a PVA glue and water mixture of about two thirds glue. 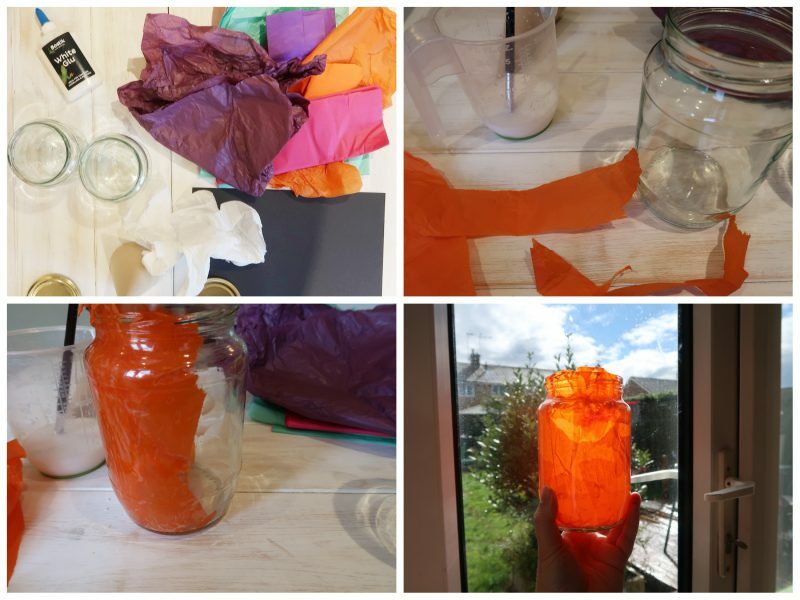 Tear strips of tissue paper in whatever colour fits the theme of your jar. 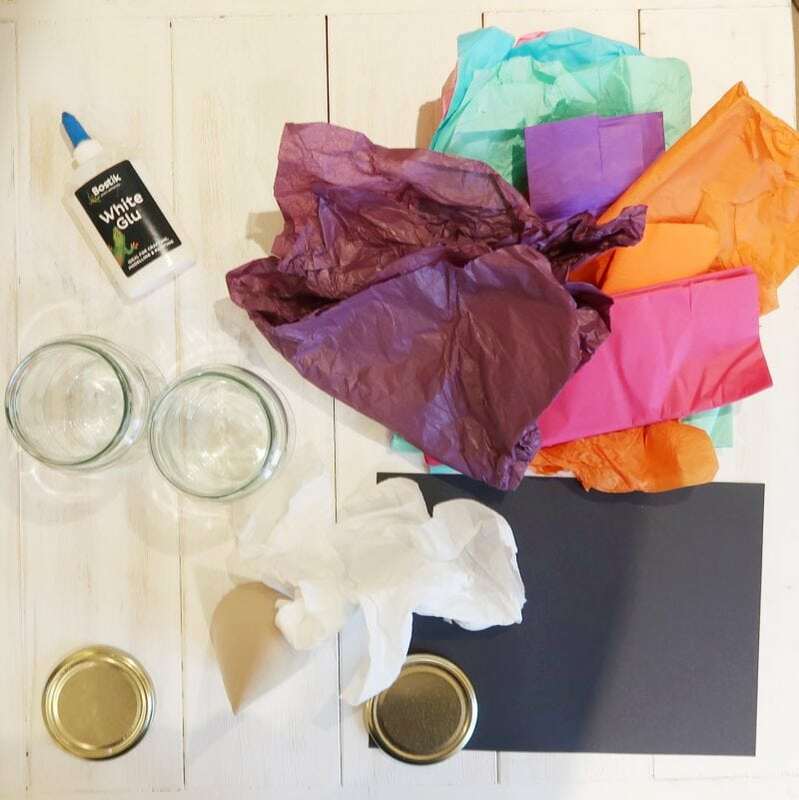 Using the PVA mixture, cover the inside of the jar with a thick layer of tissue paper. You need to make sure there are no holes but you do not want the tissue to be so thick that the jar becomes opaque. Try to stick to a single layer on as much of the jar as you can. Next, draw out the design or silhouette you would like onto black card. There are lots of templates available online, especially for pumpkin-style faces. Once you have your face or design ready, cut it out using a craft knife or sharp scissors. 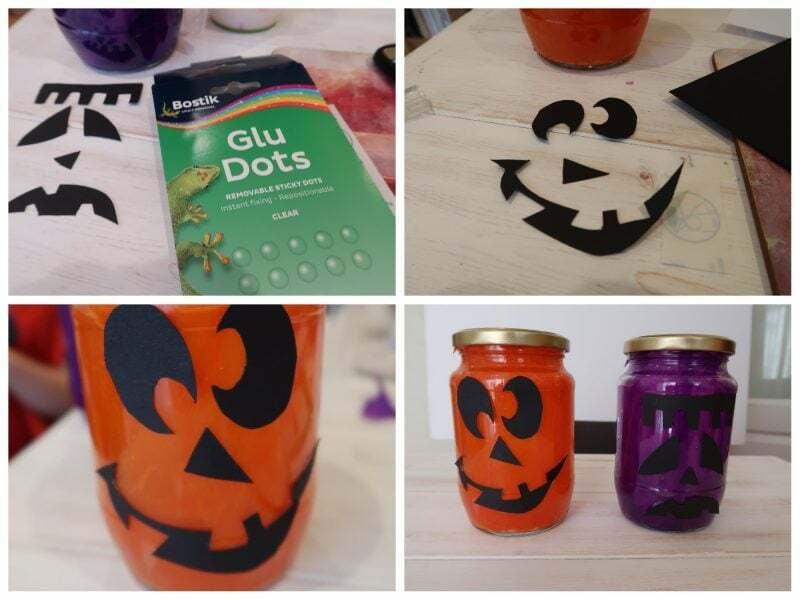 I used glue dots to stick my monster faces onto the front of the jars. This meant that the card stays put but can easily be peeled off, meaning you can change the design on the jars and reuse them if you wish. Once the glue inside the jar is completely is dry, you can add your tea light. Real candles would be a little dangerous in these jars and so electric candles are best, especially if the lanterns are going to be around children. You could also use fairy lights as long as they are the kind that do not get hot. Once your candles are secure inside your jars they are ready to be displayed inside or outside to give your house a spooky Halloween feel. 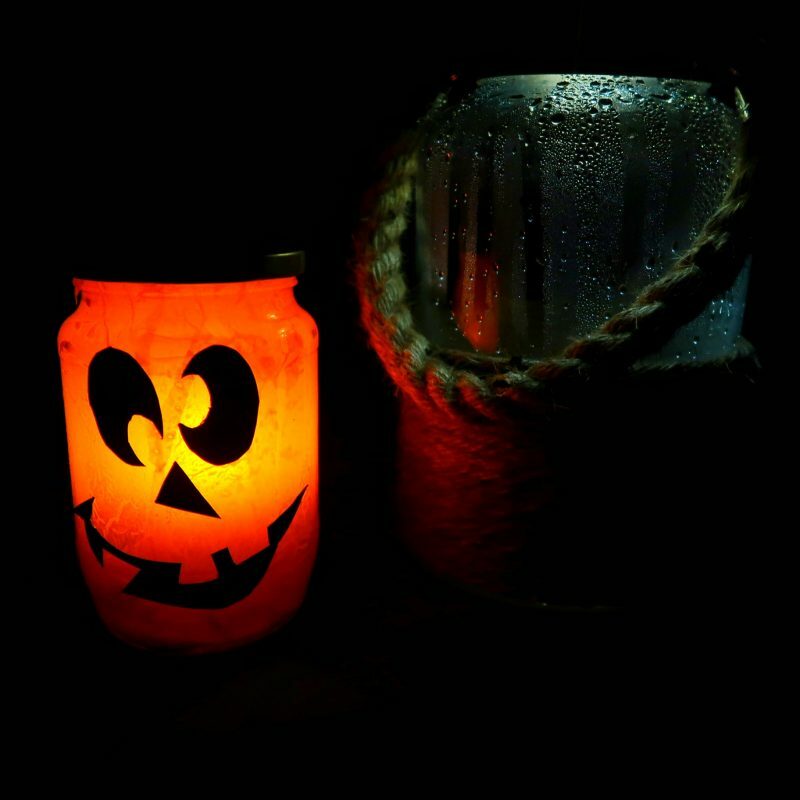 This Jar Lantern craft could also be adapted for other holidays. For example, you could use white tissue paper and a snow scene at Christmas, or multi-coloured tissue paper and cut-outs of fireworks for New Year. Please note, as Bostik Bloggers we are sent craft materials every month and given a crafting challenge.